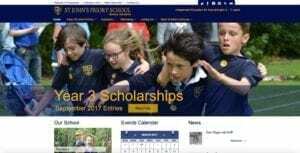 St John’s Priory School is an independent co-educational preparatory day school with a need to give their tired and rather clunky old website a fresh new look. What was needed, was a website that not only reflected the traditional values of excellence that the school is known for, but also to provide a modern edge to take the school’s image forward. The site also needed to be self-maintained so that staff members could easily update the content of the site and strengthen it’s ties with the community through constantly fresh content and social media. The new website still reflects the tradition of the sschool, but now provides a fresh dramatic new look that portray the cosey spirit and community atmosphere that St John’s Priory is well known for. As part of the design, the logo was refreshed to bring it more up to date without losing the traditional feel, combined with a fresh, light colour scheme. The site is also fully responsive for easy use on small screen devices such as smart phones and tablets.